Wire puzzles are always something I feel intimidated to try. This type of puzzles are among the hardest you can attempt to solve. Fortunately, not all of them are fiendishly hard. In fact, if you're afraid to try any of the wire puzzles, try starting by the levels 1 and 2. These puzzles can still provide a satisfactory challenge, and on top of that you'll most certainly learn some skills for the harder levels. The Tango is a great example of such wire puzzles that, while keeping the difficulty level accessible to beginners, can still be a little challenging if you're not familiar with this particular concept (I'll explain better below). 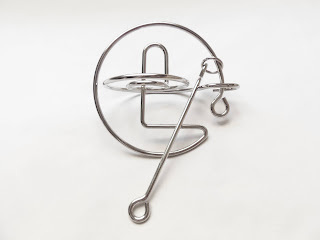 The object is simple enough: There are two identical parts that are connected by small rings and a handle with a large ring attached to one of the twin parts. Your task is to remove just the large ring. When you know the solution back and forth, putting the ring back in its starting position will be effortless. I remember when I first solved the Horseshoe puzzle. 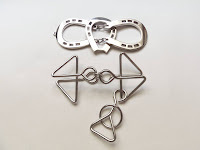 Not the Cast Horse, though, as I already knew how to solve it when I got the Hanayama version. It took me months to finally solve it. 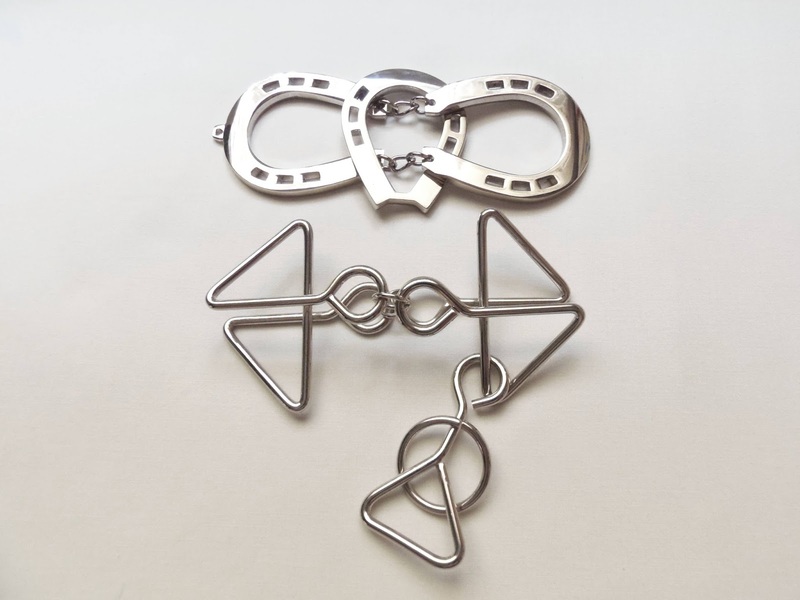 I just couldn't understand how the ring could be freed from the two horseshoes. In my defense, this was shortly after getting into puzzle collecting and solving, so I didn't understand much about metal puzzles and their solving techniques. I still don't... I struggle to solve the harder levels, but with time it gets just a tad easier due to learned skills from other similar puzzles. The tango has a difficulty level of 2/5, but even knowing how to solve it, because of the Horseshoe puzzle, I still think it should be at least a 3. The solution seems simple for veteran puzzlers, but try to give it to a beginner and see how he tackles it. I sometimes wonder how these ratings are given. Are beginners taken into account or are they given from an experienced puzzler's perspective? It's not easy to answer, and it's certainly hard to have a balanced rating when there are two extreme opposites that share the same interests. 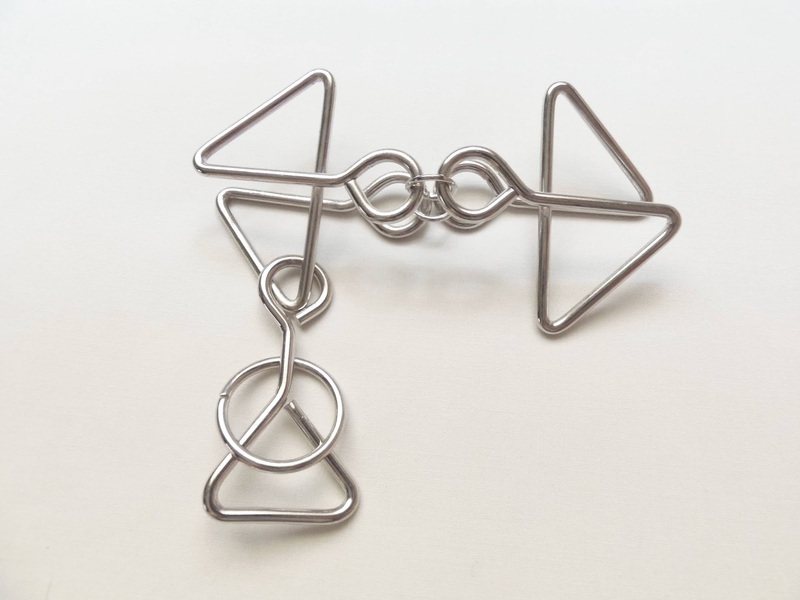 Nevertheless, the Tango is definitely a perfect candidate to learn some basic wire puzzles skills. The Horseshoe is one of my favorite wire puzzles, for obvious reasons. It was the first one I truly learned how to solve and its solution is quite elegant and unique. The Tango, for managing to keep it original, even by using a classic concept, is something worthy of praise. I highly recommend this one, even if you own or have solved the classic version. Availability: The Tango is available from Sloyd.fi and belongs to their Sloyd Metal Puzzle collection. 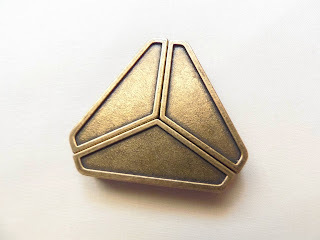 Hanayama continues to strongly support their beloved flagship Cast Puzzles with the first one released for 2013, the Cast Delta. Designed by Hong Kong native Kyoo Wong, the Cast Delta is a symmetry beauty with its identical three pieces. The theme for the Delta is simply "number three". The Cast Delta really stands out by its simple and yet elegant design. The construction looks to be brass, which personally is not my favorite metal, because of that characteristic smell that it leaves in your hands. It does has its advantages, though, due to its rugged texture it hardly gets scratched, unlike some puzzles that have an extra coating finish. The size is small, but feels sturdy and comfortable to handle and maneuver. It measures 5.7 x 5 x 1cm (2.2" x 2" .4"). 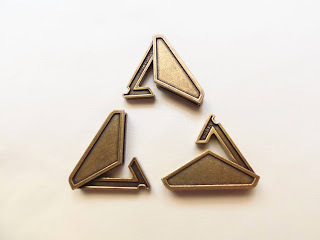 When first looking at the Cast Delta, one wonders how it is possible for the three pieces to come apart, since each one seems to be blocked by the other two. Continuous fiddling with the puzzle doesn't seem to do much good, because you end up in the same state whatever you do. It can get frustrating after a while, believe me. 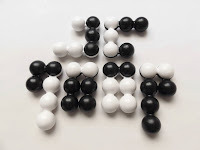 Before attempting to solve it, I thought the solution was a simple coordinate-motion technique - Just separate the three pieces pulling on them simultaneously. When I noticed the hooks on each of the pieces I immediately knew that there was something else to it other than simply pulling on the pieces at the same time, although this is partly true. The ingenious part is, however, hidden from view inside the puzzle, so you need to figure out how the pieces must be separated. All you can see is a slight view of the inside just a few millimeters long. The rest has to be filled by your imagination... Or frustration. I went for the latter instead the former, since I was becoming impatient after almost half an hour. What's more surprising is that the puzzle is rated as a level 3/6, so it shouldn't be this difficult, or am I missing something. Warning! The following paragraph contains spoilers. Turns out, to solve the puzzle you actually need a substantial amount of force applied to the pieces. Something I wasn't expecting from a Cast Puzzle. I solved it merely out of frustration, when I was about to give up on it and had tried almost anything I could think of. Using the force was the last resort and, ergo, it was solved in an instant. I was actually disappointed with the solution. It goes against what I think Cast Puzzles are, which have elegant solutions that mainly use your intellect instead of just your strength. I believe there's only one other Cast Puzzle that needs a considerable amount of force to be solved, and that's the Cast Helix. Solution: Click here to download the solution for the Cast Delta. 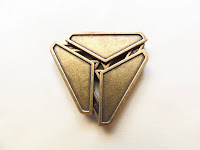 Availability: The Cast Delta is available from PuzzleMaster at $12.95 CAD. For all the others in the Cast Puzzle family, check out their dedicated page. Recently, I've been reviewing SmartGames' puzzles and I'm really loving them. They all have these clever concepts and designs that can put your skills to the test. Bend-It is yet another one of SmartGames' great examples of how to introduce new ideas into their puzzles and make them a joy to play. 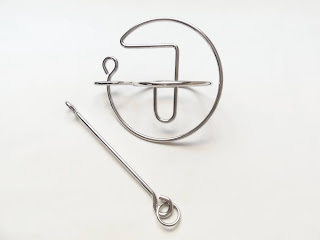 As with most of their catalog, the Bend-It puzzle was designed by Raf Peeters, who doesn't seem to run out of great ideas anytime soon. 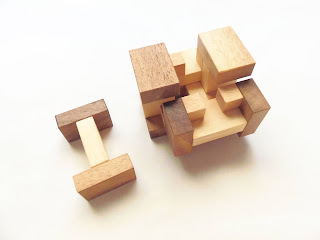 The puzzle itself is very well built with a practical design. 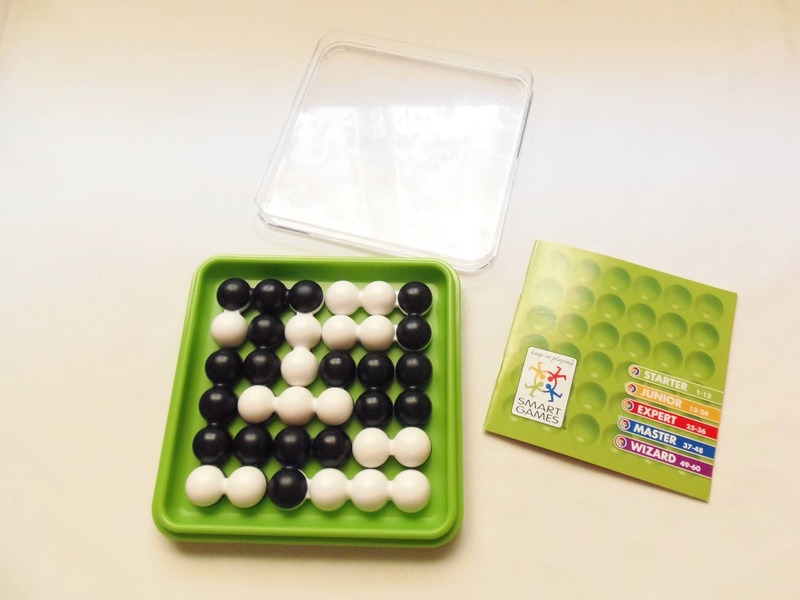 The board has a clear plastic lid to avoid losing the pieces when traveling. 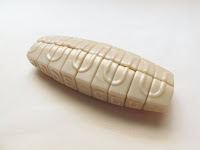 The pieces have this heavy and strong structure which indicates they will withstand almost anything. I very much like the color palette chosen for the puzzle. 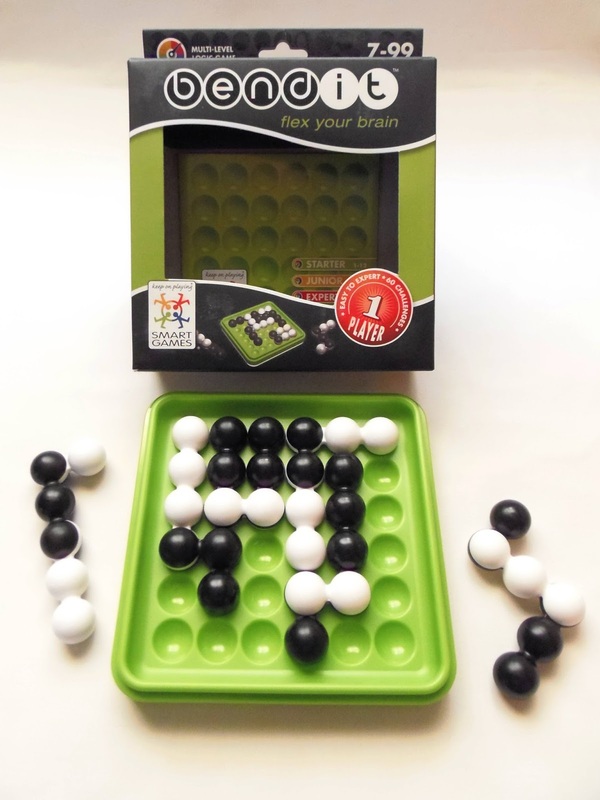 The green of the board combined with the black and white pieces plus the transparent lid give the puzzle this sophisticated and stylish look that's very welcoming, considering the high number of colors SmartGames usually chooses. Bend-it, like its name suggests, uses a clever mechanism that allows you to bend each of its six pieces into different arrangements. Each piece can be bent at two different points. Those points are on different places on some pieces, so there will be distinct arrangements even when bending two pieces with the same angles, as shown in the photo below. The number of black and white balls on each piece (6 balls per piece) also varies, which can be 4/2 or 3/3. 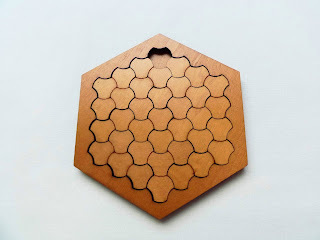 When all the pieces are packed into the board it's almost impossible to know where each piece starts or ends. 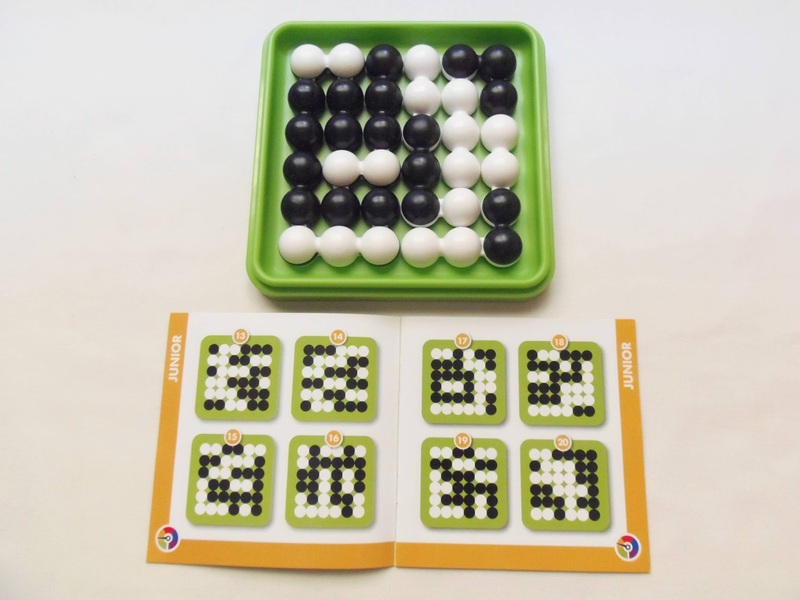 This is how the challenges are made: you're provided with a picture of all the pieces packed in the 6x6 board with just the color pattern visible. 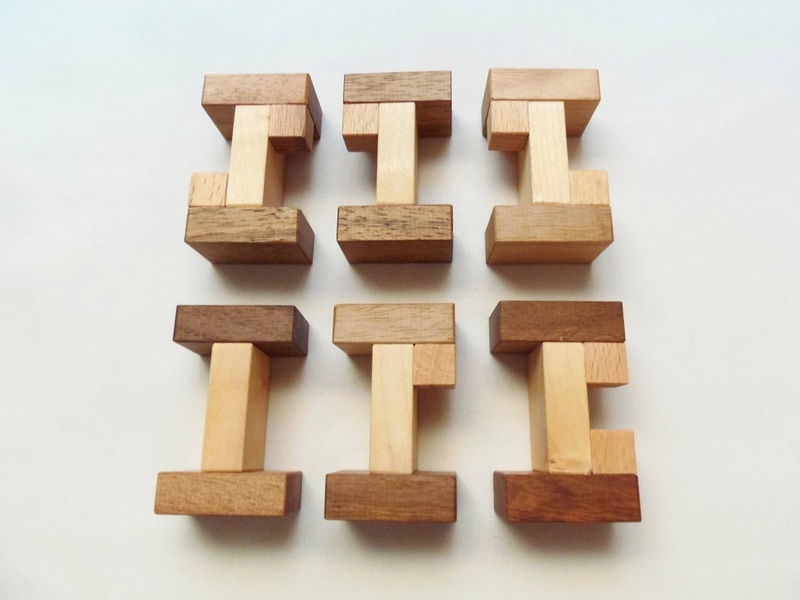 Your task is to find out, by bending each piece accordingly, how to create the pattern you see on the challenge booklet with the same six pieces. The booklet comes with 60 challenges divided into 5 different levels of difficulty, from 'Starter' to 'Wizard'. Some of these are pretty easy, and there's also some cases where you don't even have to bend all the pieces, although I'm not gonna say which ones do that. The 'Wizard' challenges are quite tough and do require some heavy thinking, but for someone already experienced in packing puzzles, I'm sure this won't be a problem. 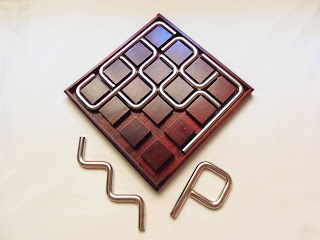 The Bend-It puzzles are very carefully thought out and provide a progressively harder challenge, but in the end they're very rewarding and satisfying. It gets addictive as soon as you understand the game's mechanics which won't be that difficult. No matter what your packing puzzle skills are, you're guaranteed to have great time and fun with Bend-It. 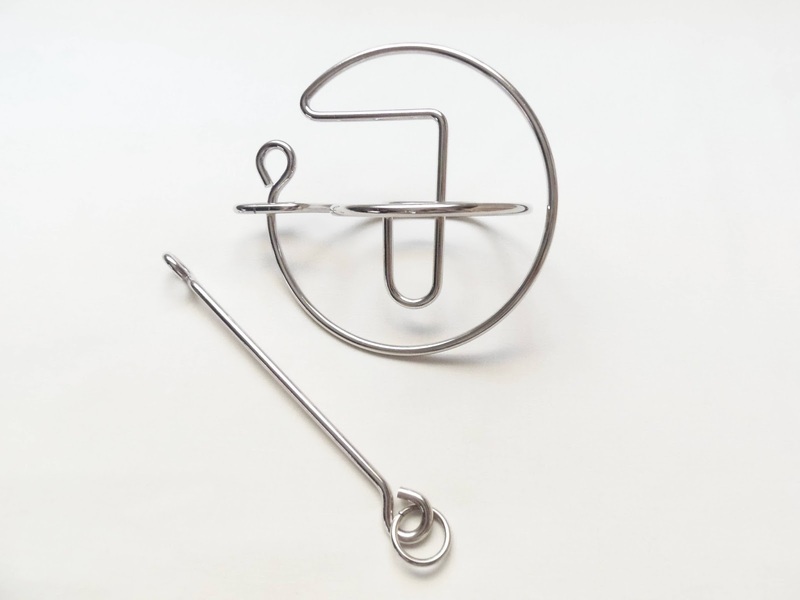 Availability: You can get the Bend-It puzzle at Sloyd.fi in Finland for €19.50. What happens when you put Ola Jansson, Oskar van Deventer and Uwe Meffert in a room? 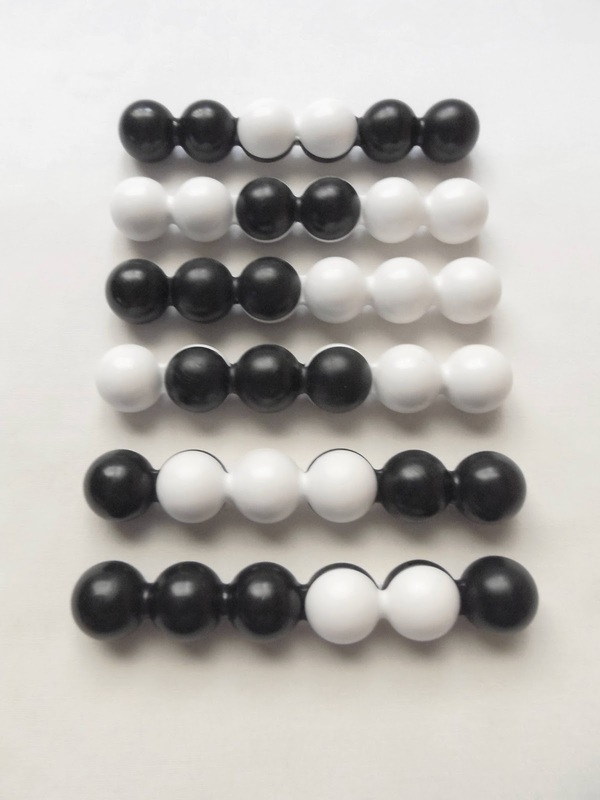 The Jade Chopsticks happen, a beautiful and different kind of Twisty puzzle. The final product is a combination of ideas, first the 1x2x5 designed by Ola, which was later followed by Oskar's extreme version, the 1x2x13. The Chopsticks version is scaled down to 1x2x9 - and my guess here is to just make it more stable - and with Meffert's magic touch in the final design, we see an elegant design without the need for stickers or any other special colors. 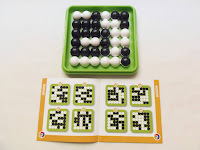 Instead of stickers, the patterns featured on the puzzle are made by two sets of lines, curved on one side and straight on the other. On the left and right sides we can see the words 'Jade Club' written in a "semi-ambigram" - that's because the letters are rearranged to form another word instead of simply flipping it over like a true ambigram. Each letter can still function as a double letter depending on how you're seeing it. 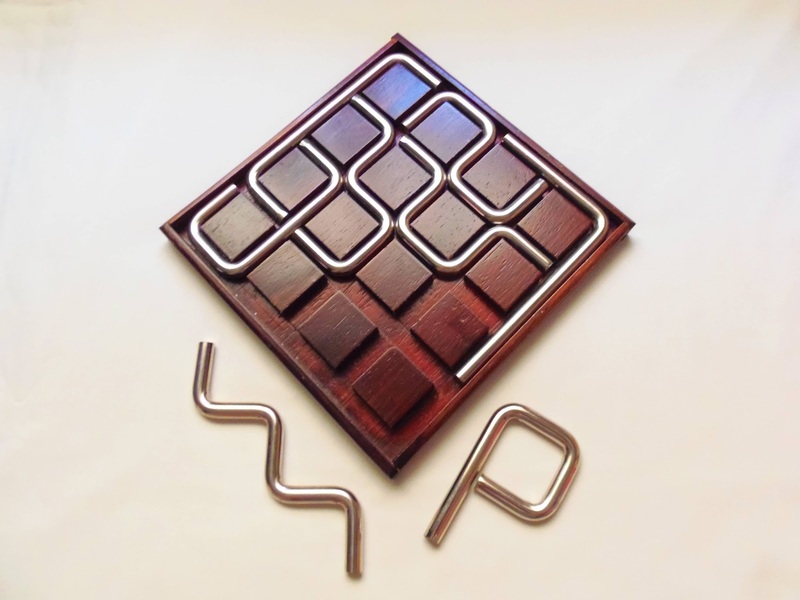 Much like any other Twisty puzzle, the goal is to mix it up and try to put it back in its the original pattern. In this case, when scrambled, the puzzle will have a mixture of both types of lines and the left and right sides will have the two words jumbled up. It's not very easy to turn the puzzle though, especially along its horizontal axis, since you're trying to align nine segments at the same time. 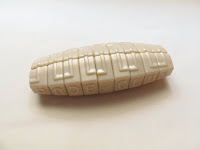 However, the individual segments do turn nicely and smooth. So, how hard, or easy, is the Chopsticks to solve? - Well, that pretty much depends on your skills with Twisty puzzles. Since I'm not that good, it took me about 10 minutes or so. Even after I've successfully solved the two sets of lines I still had to rearranged the words, which was the hardest part. Overall, and compared to other Twisty puzzles I still think this is an easy puzzle, and proving that is PuzzlerMaster's rating of 6/10, where 5 is the lowest on the scale. Made with the Jade Club in mind, the Jade Chopsticks is a stunning puzzle with an original design. While it's not remotely challenging for experienced puzzlers, this is a perfect collector's puzzle worth having in your collection. 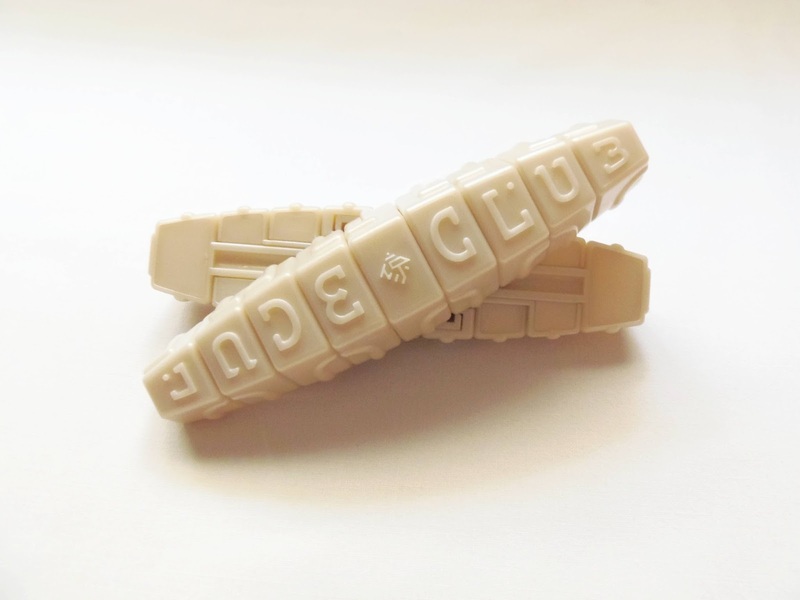 The Chopsticks come in a milky white color, but I know there's a gold version for Jade Club members, although I'm not certain it's still available at this point. If you can get your hands on one, do it quickly, since these puzzles tend to run out of stock fast. Availability: The Jade Chopsticks are available at PuzzleMaster for $20 CAD. Saturnus - What a great name for a puzzle! Fortunately, it's not just the name that it's great, but the actual puzzle itself is pretty good with a challenging difficulty level, yet without becoming too frustrating... Well, at least for an average puzzle solver like myself. The puzzle has that recognizable Saturn-like shape and it's very well built - almost perfect - considering its curvy structure. 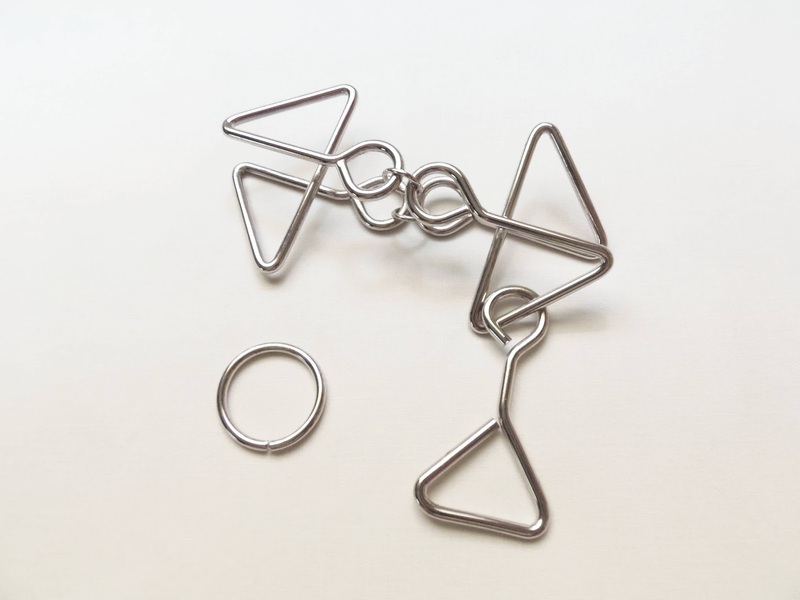 Made from the usual 3mm nickel plated wire, which is ideal for metal puzzles, since it gives a smooth surface that's easy to handle and doesn't leave that characteristic metal smell in your hands. 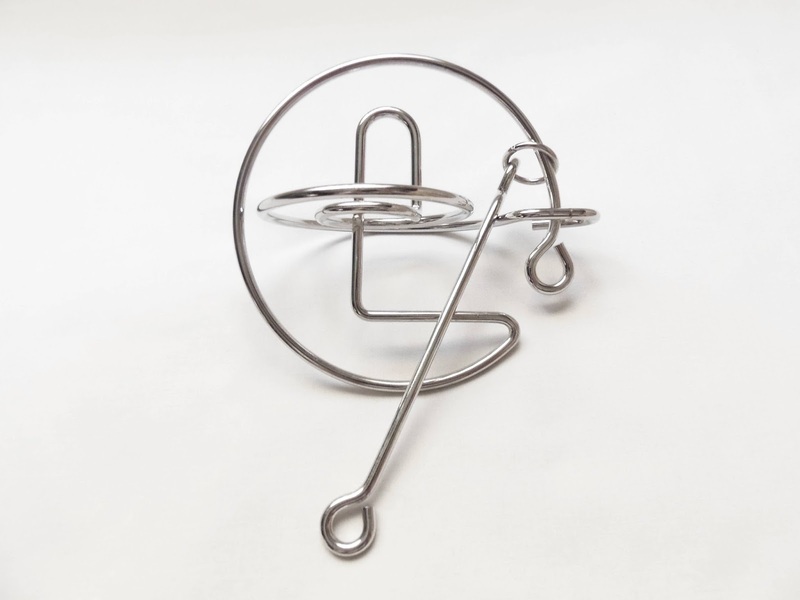 The size is also relatively big for a metal puzzle, with a diameter of 12.5cm and 14.5cm for the handle (4.9" x 5.7"). While it gives a sense of a more bulkier puzzle, it actually feels really nice to play with. With a medium difficulty level - I'd say it's about a 7 or 8/10, although highly dependent on whether you're used to solving metal puzzles - the solution is anything but straightforward though. The goal is just to free the handle from the main frame, while being able to return it to its original position afterwards. If I had to describe the solution with a word or two, 'orbit' and 'recession' would fit perfectly. It represents the analogy of planet orbits quite well. You'll understand it better once you solve it. It actually took me a while to understand the correct orbit of this Saturnus puzzle. Even after I was able to free the handle for the first time, it wasn't before several more attempts that I really knew how to return the handle back to its position. The handle, as hinted by the dimensions above, is longer than the frame's diameter, so it's not that simple to remove it. You need to carefully analyse the puzzle and look for unusual characteristics - They're there for a reason. 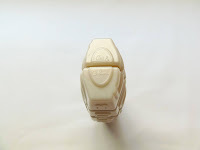 Assuming you know where the handle will be exiting, and this is not difficult to figure out, there isn't much room for the handle to navigate around. A couple of twists of the handle also help - Actually, they're really necessary in order to progress. Metal puzzles are always a love/hate thing for me. The Saturnus, fortunately enough, was a nice surprise and I enjoyed it very much. The fact that it doesn't have string parts to make knots appear out of magic makes it so much better and less scary. A worthy addition to your collection. 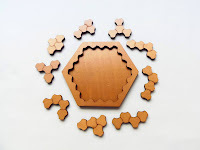 Availability: You can find the Saturnus puzzle at Sloyd.fi for about €14. 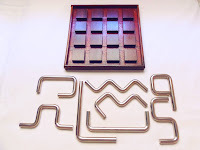 Check out other metal puzzles from Sloyd here. 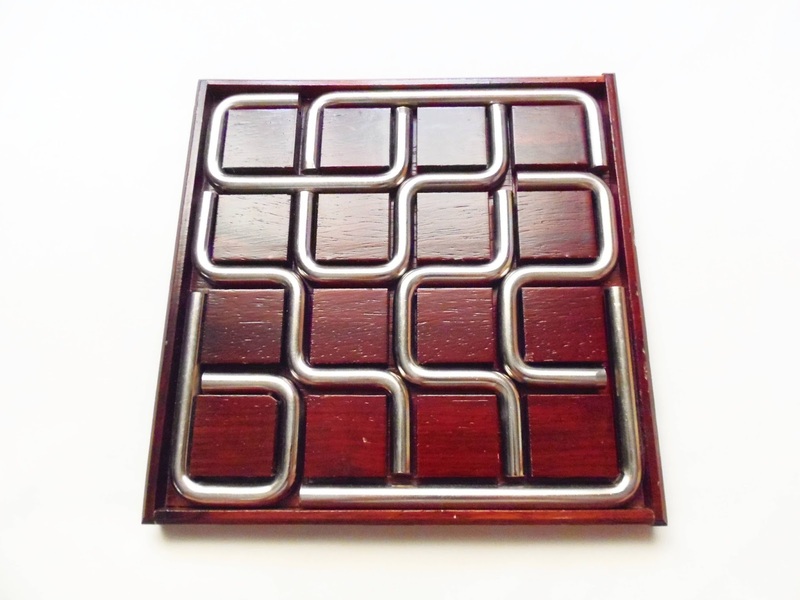 The Sixi Cube is proof that Václav Obšivač (Vinco) can craft any type of puzzle and do a magnificent work every time. 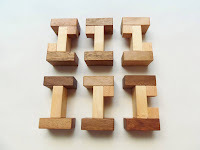 Many of his designs need coordinate motion and steady hands to be solved, but today's puzzle is a little different, since it doesn't require a simultaneous assembly of its pieces. If you think the absence of coordinate motion makes the puzzle easier to solve, think again... After all, this is a Burr puzzle. The puzzle is superbly crafted with Vinco's trademark waxing finish, giving it a smoother surface while also making it easier for the pieces to slide in place. 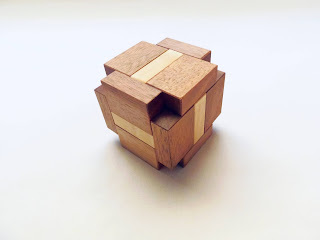 Another great characteristic of Vinco's puzzles is the use of different kinds of wood to create a beautiful contrast between the pieces, and this particular version of the Sixi Cube is made from walnut (dark) and acacia (light). It's a relatively small puzzle, measuring 5.6cm (2.2"). 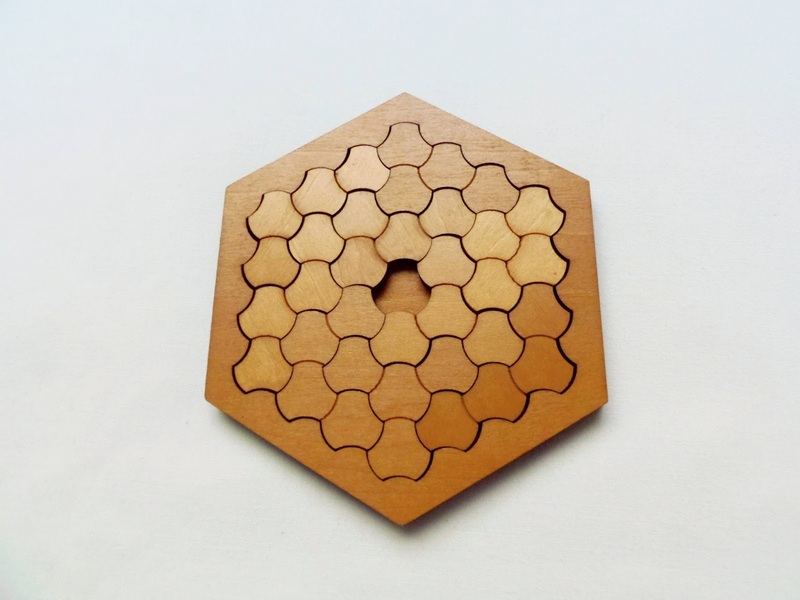 Comprised of six distinct interlocking pieces, with two pairs being a mirror of each other, the puzzle is rated as a difficulty level of 3/5 and a Burr level 1 - It's considered a level 1 because it's a solid burr (no internal voids) and requires only one move to remove the first piece. Nevertheless, for someone not used at solving Burr puzzles, this can still be quite challenging, considering the pieces need to be arranged in a specific sequence. One particular thing you'll immediately notice when you receive the puzzle is that it comes disassembled in its box. Unless you want to keep it in the box in this shameful state, you're forced to solve the puzzle. While this might seem a mean thing of the designer, I agree that it's a good thing. How many puzzles have you bought in their solved state, took them apart and assembled them back? - I bet your answer is more than zero. My OCD personality just doesn't allow to leave a puzzle in its unsolved state. I'm glad not many designers do this, else my free time would be spent solving puzzles uninterruptedly. Each piece, with the exception of the plain key piece, has one or two small cubes attached to the main structure in different arrangements. The result is a complex solution with each piece having a specific order of placement. At first, this task seems too difficult, but as you solve the puzzle multiple times it becomes progressively easier. After several attempts, I can now solve it in less than one minute, when at first it must have taken about an hour to do it. Vinco's Sixi Cube makes for a nice break of coordinate-motion puzzles. Perfectly crafted with high-quality materials, it's not extremely difficult, even for Burr beginners, but will sure put your patience to the test if you're easily frustrated by a challenging puzzle. Availability: The Sixi Cube is available from Brilliant Puzzles for about $20 USD. You can browse other puzzles from Vinco at Brilliant Puzzles dedicated section. 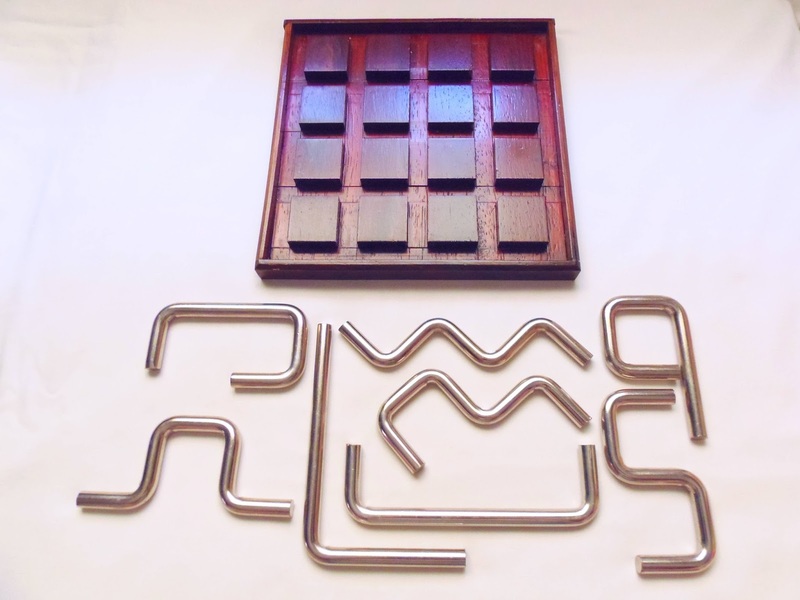 Paradigm Puzzles are a series of six packing puzzles designed by William Waite and produced by Family Games America. I've been reviewing this series for a while, with already four of them reviewed, and today, it's time for the Tetrascales. The Tetrascales is, like all of the puzzles in the Paradigm series, visually stunning with a beautiful symmetrical pattern. The effect is created by 9 pieces with different arrangements, but always with four segments, hence the name "Tetra". The board and pieces are made from laser-cut wood, with measurements of only 11.1 x 10.2cm (4.3" x 4") - This makes the puzzle very light to handle. I would've liked to see different wood colors for the frame and pieces to create a nice contrast, but it's still well made. There are hundreds of possible solutions with the empty space in various positions, 354 of them to be more exact. However, only a fraction of them are possible with the hole in the middle. Can you find one? - This is actually quite a difficult puzzle to solve. Getting the hole anywhere on the frame is easy enough, but being able to get it in the center has proved to be an arduous task. The pieces are double-sided, unlike some of the other ones in the series, so you can choose which side fits with your arrangement. Usually, when solving a packing puzzle you start by one of the edges and work your way to the opposite one. With this puzzle, however, the strategy to solve it is a little different. After several unsuccessful attempts, I had to come up with a different approach, and started to place the pieces around the center towards the edges. Starting from the edges and hoping for the best as you approach the center is definitely not the best way to go about it, so after a while I was finally able to succeed. This is a level 8/10 puzzle, and judging by the number of unsuccessful attempts, I'd say it's about right. You can start by getting the hole in different places around the frame to better understand how the pieces interact, and when you feel ready to tackle a more challenging objective, go for it. The puzzle comes packaged in a different solution other than the hole in the middle, and without providing you with a solution, you really need to solve it if you want to see it in its intended state. 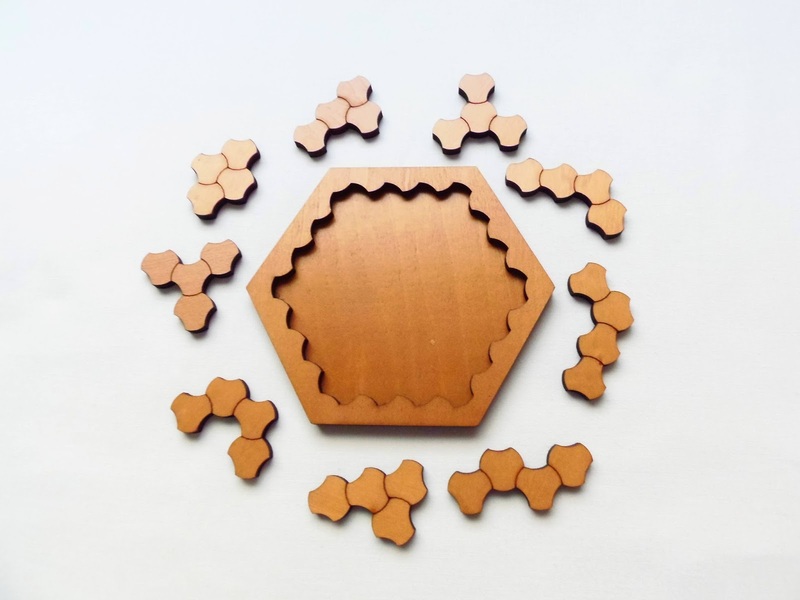 The Tetrascales is yet another fascinating puzzle by William Waite and a deserved member of the Paradigm Puzzles family. 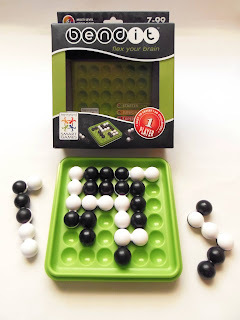 The high number of possible solutions ensures you can keep playing with it for a long while, even after you find the solution for the hole in the middle. A must-have for packing puzzle fans. Availability: You can find the Tetrascales at PuzzleMaster as well as the rest in the Paradigm Puzzles family. It's time for another Constantin review, and this is a Big one, Rechner BIG. Rechner can be translated from the German as calculator, computer or even arithmetician, so I'm not sure what the designer had in mind when he created the puzzle. What I'm sure of though, is that this is one tough nut to crack. The name BIG is simply because this is a larger version of a smaller puzzle, although you can only find the large version at Sloyd. Besides its large size, which by the way measures 21cm in diameter (8.3"), the puzzle is also quite heavy, mostly due to the solid metal pieces with 1cm thickness (.4"). With a puzzle this size everything feels great to handle, and even though it's a challenging puzzle you will have lots of fun with it. The build quality seems quite good, although there are a few spots here and there where the wood looks scratched. 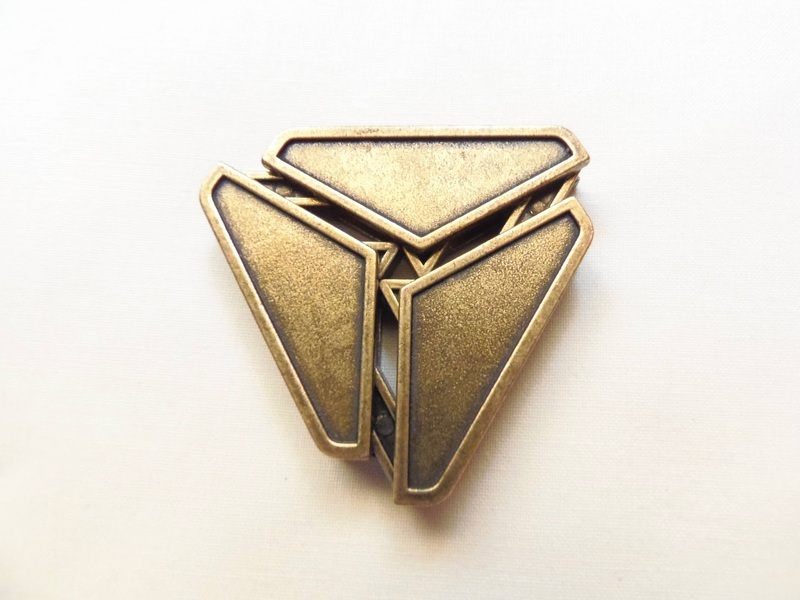 I suspect this is because the metal pieces have jagged edges when they could've been just smoothed out. 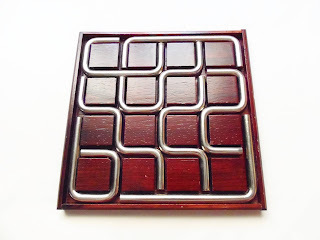 Apart from this the puzzle looks stunning and the deep red wood looks great in contrast with the metal pieces. Each of the eight distinct pieces has a perimeter of exactly 5 units and are arranged in a 4x4 grid. When all the pieces are correctly packed inside the frame no empty spaces should be visible. The puzzle comes already packaged in its solved state, so if you want to solve it by yourself without help, I recommend opening it upside down or ask someone to open it for you and remove the pieces from the tray. This is a hard puzzle, so be prepared to spend a while with it. It took me over an hour to solve this one. I reckon one of the reasons why it's so challenging is because it's hard to visualize how to pack the pieces into the tray. 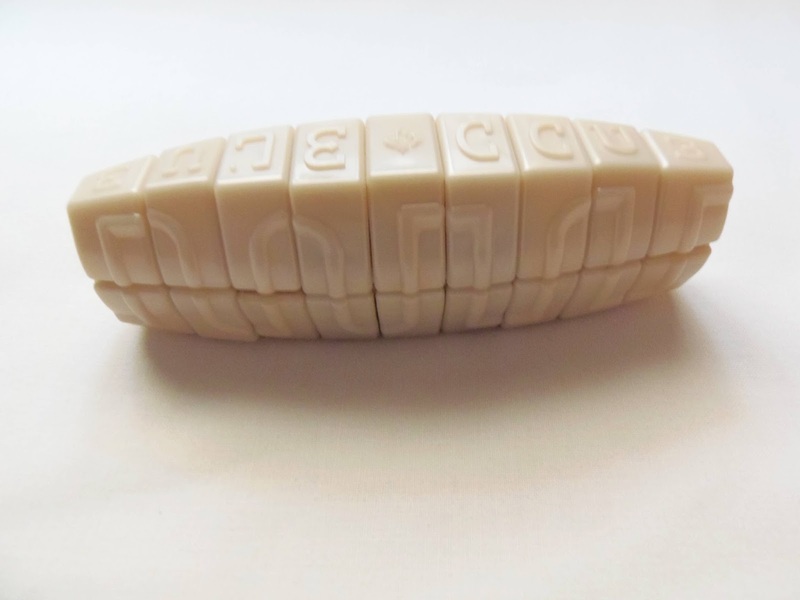 Packing six or even seven pieces is quite easy. Rearranging all eight pieces, however, is a whole other matter. I don't know how many solutions are there, but given the nature of the pieces I bet there's a few more to discover. Another great design by Jean Claude Constantin, Rechner BIG is not only big in size, but in originality as well. The size screams to be displayed in a big room with other nice puzzles. If not for its challenging concept, at least you can look at its superb appearance. Highly recommended for a sophisticated puzzle collection. Availability: The Rechner BIG puzzle is available from Sloyd in Finland, with worldwide shipping.